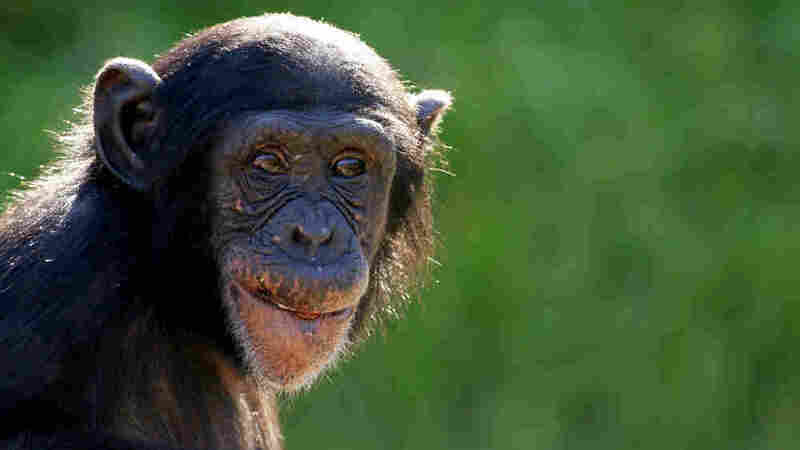 Humans' Big Brains Tied To Chimps' Immunity? Researchers at Stanford University have come up with a provocative hypothesis: They argue that the same set of genes that explains why chimpanzees are protected from some diseases also explains why humans have big brains. Humans' Big Brains Tied To Chimps' Immunity? It's a provocative -- even astonishing -- hypothesis: Could the same set of genes that explains why chimpanzees are protected from some diseases also explain why humans have big brains? That's what researchers at Stanford University are suggesting. The genes in question control a type of white blood cell known as natural killer cells, or NK cells. "They can make a big difference as to whether you get sick, or you don't get sick," says Peter Parham, a professor of cell biology at Stanford. Parham has been studying the genes that control NK cells. And it's not a simple picture -- there are a lot of genes involved. Humans aren't the only primate with NK cells. Chimpanzees have them as well. But Parham realized that there must be some key differences between the ways NK cells in chimps and humans behave. "There are a number of fairly major infections that infect humans but don't infect chimpanzees," he says. "HIV is one, malaria seems to be another." Not only do natural killer cells play an important role in preventing disease, they also play a role in controlling blood flow between a mother and her developing fetus. As a pregnancy progresses, blood flow becomes more critical. What Makes Chimps And Humans Different? "As the baby gets bigger, its demand for blood goes up," says Parham. That's crucial to keeping that big brain of ours growing in the womb. Trading A Big Brain For Immunity? But there seems to be a trade-off. The kind of NK cells that are good for getting lots of blood to the developing fetus are not as good for dealing with infection, and vice versa. As he reports in the journal, PLoS Genetics, Parham looked closely at the kinds of NK cells most common in humans, and compared them with the NK cells most common among chimpanzees. "[T]he chimpanzee system seems to be much more optimized for dealing with infection," Parham says. The human system, on the other hand, seems to be optimized for getting lots of blood to the developing fetus so our big brains can grow the way they're supposed to. That may have something to do with why we consider ourselves smarter than chimps. Mary Carrington, a senior investigator at the National Cancer Institute, also studies the genes that control NK cells. She says it's not so surprising that chimpanzees need a more powerful immune system for fighting diseases than humans do. "Humans have been cleaning up all the time, for a very long time, by building shelter, cooking food and doing other things like that," says Carrington. "And that's decreased our exposure to infections pathogens." But Carrington thinks Parham's suggestion that there's a trade-off between a potent immune system and a big brain is a bit of a stretch. She says it's based on data from chimps that "we don't necessarily have a really good handle on." But, she says, "it's certainly provocative."